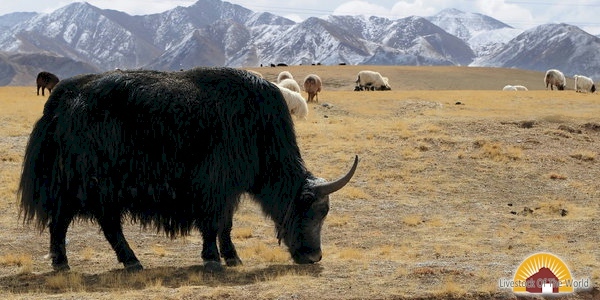 Plateau Grassland Yaks are found on the cold highland pastures of the southern and northern Qinghai province of China. They look similar to wild Yaks, but they are domesticated. Plateau Grassland Yaks have a relatively large body and a big head. Both sexes are horned. Similar to the wild yak, they have greyish-white hair down their back and around their muzzle and eye. They adapt well to the cold and humid climate at high elevation.